SPY rose by 1.8% this week, while my account fell 0.2%. The loss-floor is now -7.9%. Euro news: On Thursday, Mario Draghi of the ECB said that he would do whatever is needed to save the Euro and ”believe me, it will be enough”. This pixie dust caused the market to zoom! For 24 hours. On Friday, Draghi announced that he would meet with Germany next week to get approval for the money-printing he had just promised. The market zoomed! For about 12 hours. On Saturday, Wolfgang Schäuble of Germany said Nein! as expected. Will the markets fall on Monday? US news: The Fed’s committee meets next Wednesday. The expected result is “no action”. The markets will probably be up on Tuesday and down on Wednesday. UPRO: Non-robot day trade. I successfully caught the end-of-day ramp on Tuesday, but the gain was insignificant. It seems that UPRO is not a suitable vehicle for these half-hour trades. Perhaps I need to upgrade my account to ”Options level 1” so I can buy calls instead of shares to increase the leverage. 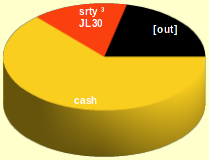 SRTY ¹⁺²: I would have had a profit for the week if this trade had gone according to model! New rule: If the model says “keep” but the robot sells, then put in a limit-order to try to get the shares back at the erroneous sale price. Last Friday I didn’t get home until after the market closed, but the sale price showed up again during the after-hours session so I could have saved this trade. SRTY ³: Another quote problem. Used a limit-order to break even. Quote fetch&archive system: The problem with SRTY ¹ wasn’t a single wrong quote, but a set of wrong quotes over a period of days, which led to accumulating errors in the indicators. Previously I was replacing Schwab’s quotes with stockchart.com’s quotes once per week, but apparently an entire week is too long and the indicators can diverge significantly in only a day or two. Solution: pull replacement quotes from barchart.com once per day. This worked partially on Wednesday (closing price was wrong, which is part of why SRTY ³ failed), worked correctly on Thursday, then failed Friday because barchart.com decided to show two days of data in response to a request for one day (they fixed this on Saturday). So now I am using three different sources for quotes, none of which actually does what I need! Maybe I should move my account to Interactive Brokers. When will the models give a “buy” signal? TNA: A day or two at least. STDDEV(80) is only a little higher than its EMA(43). TZA: Several days at least. The short-term trend is up! URTY: Not for a while. TRIX(176,15) is approximately zero. SRTY: Could happen on Monday, if there is a big gap-down followed by an hour’s retrace. IAU: Could happen next Friday, if current trends continue. MACD is only slightly negative. The US equity markets haven’t gone anywhere since February. For the last month, IWM (the small-caps) have been in a down-trending channel, while the SPY (the large-caps) have been in an up-trending channel. As of Friday, IWM has reached the top of its channel, while SPY has burst through the top of its channel. 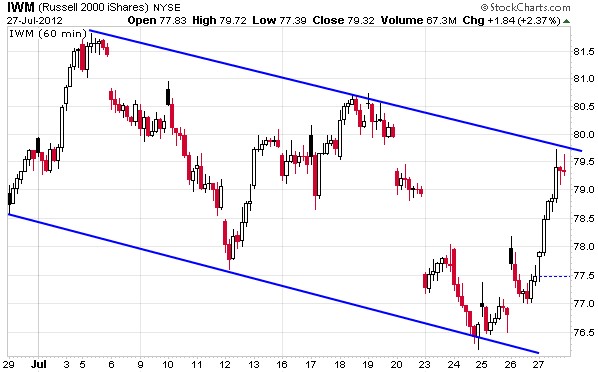 For next week, I expect either a gap-up to escape from the channel or a corrective bounce-down to stay inside it.